While your toolbox will come in handy when carrying the tools to and from the job site, a tool belt is what you will need to carry them around the work site when working. Tool belts are comfortable carrying bag systems that are designed to hold different types of tools, and they are widely used in various industries. From electricians and carpenters to plumbers, craftsmen, and DIYers, a tool belt is always handy to have around. With the best tool belts, you get better work efficiency, time-saving as you have all the tools nearby, reduced back pain because you will not need to bend to pick up tools and also prevents tool loss in the job site. There are many types of tool belts from different companies in the market, and they are meant for different kinds of users. And in this guide, we provide the information you need and some handy reviews to help you choose the best one. 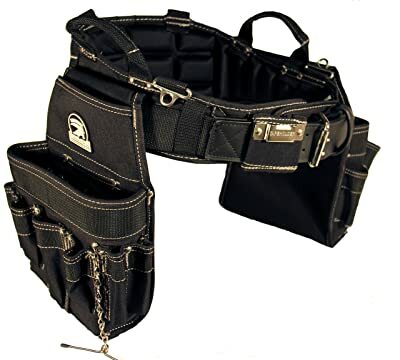 Gatorback makes their model B145 tool belt for carpenters looking for something that makes it easy to organize all their tools in one place and also allows for easy access. Its highly breathable and sweat-free construction is one of the key elements that make this one of the best carpenter’s tool belt. Also, the belt features riveted and bar-tacked stress points that are designed to give it extra strength to ensure maximum durability. The rugged and durable nylon material makes this a tough belt that will withstand many years of abuse and tough work environments. Overall this is a lightweight belt that will ensure that you do not have to carry any unnecessary weight. But what many carpenters will love is that there are plenty of easy to access pockets on the belt that have a unique box shape and will not sag. Also, there are some convenient carry handles that will make this tool belt easy to wear/remove and carry it around. A good tool belt does not have to be expensive, and this is more when you do not have a lot of tools to carry around because a highly affordable one like this one by Custom Leathercraft will still work well. It is a heavy-duty suede leather tool belt designed to be tough and rugged enough to handle any work environment. 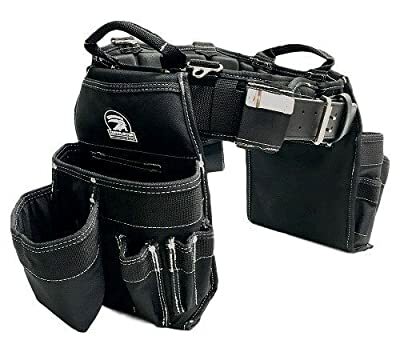 Besides being the cheapest in our tool belt reviews, the handy tool belt has a decent storage space with a total of three different size pockets that include two main ones for nails and tools and a small one for things like pencils and pliers. Also, there is a handy side loop that will hold hammers and other long handle tools that will fit. Wearing and removing this tool belt is made easy by the quick release buckle, and the design of the pocket ensures that you can easily access all your tools. And with a waist range of 29 to 46 inches, this tool belt can fit almost anyone. 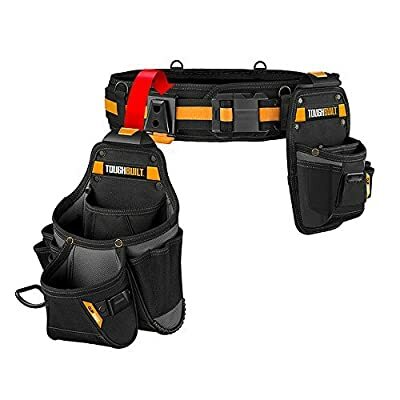 A strong and durable tool belt and bag like this on by TradeGear is designed to offer many years of great service and to make it easy to carry all your carpentry tools to any job site. The tough DuraTek fabric, metal rivets, and bar-tack stitching are what make it such a tough tool belt. Besides the durable construction, this tool belt also comes with air ventilated belt padding and a top quality breathable fabric that is designed to make this a very comfortable belt by ensuring that you will sweat less when wearing it. When compared to other top quality tool belts, this one is also relatively more affordable and it also provides lots of storage space for all your tools. The storage space includes a couple of heavy-duty pouches and 15 highly durable pockets that come in varying sizes to accommodate different kinds of tools. There are also some easy to carry handles that are designed to make this tool belt easy to wear and carry around. Another top quality Gatorback tool belt that you will be happy to have around as it is designed to offer top-notch quality service and for use in almost any work environment. And so whether you are on the market for the best tool belt for framing, carpentry, roofing or general crafts, this belt will be perfect for you. Its durable construction that features heavy-duty DuraTek nylon, riveted stress points and bar tacked stitching makes it rugged and highly durable, and you can be sure of many years of great service. And the size is also perfect as it will always provide an excellent fit provided you choose the right size for your waist. The pockets come in a box design that prevents sagging, and there are also some convenient handles for easy wear and transportation and it is also well-ventilated to ensure maximum breathability and comfort. Whether you are shopping for the best leather tool belt or are just looking for something comfortable and functional, this 4-piece construction rig by OX tools will work well for you. It is an oil-tanned leather product that feels nice and soft even when new to ensure that it will not need any break-in. With a total of 22 pockets and dedicate pouches and loops for things like a hammer and a clip for your tape measure, this tool belt will hold all your tools comfortably. And some of the pockets are partitioned on the inside for even easier organization. The rivet reinforced stress points and double stitching also makes this a tough and tear-resistant belt. If looks matter to you, the natural look of the oil-tanned leather and the antique bronze finish hardware will impress you as they give the belt a highly appealing appearance. Occidental Leather 5590 is one of the best electrician tool belts not only in our reviews but also in the market as it is made specifically to suit the needs of a typical electrician. One of the things that make it such an amazing tool holder is the tool hand-specific system for holding tools as it will promote a great working rhythm on the job. The no-spill system also ensures that you never have to worry about losing any of your pricey tools and this is a function engineered belt designed to suit the needs of the modern electrician. There are lots of pockets to accommodate many tools, and its genuine leather construction also helps to keep them safe. This tool belt is lightweight and easy to wear, and it comes in several sizes that will ensure that users always get a perfect fit. And the pockets are designed to hold shape well which makes this an even more convenient tool belt. If you are a framer that is looking for something to help with tool organization, Dewalt’s DG5617 is one of the best framing tool belts for you out there. It comes with a padded and fully adjustable yoke-suspenders designed to make it more comfortable and easy to wear by redistributing the weight, and the belt is also easily adjustable to fit waists between 29 and 46 inches. There are some large gusset-style pockets on the apron, 9 main ones and an impressive 20 small pocket that are designed to ensure you never leave anything behind. And these pockets will also include a zippered one for your cell phone and other valuables and a special one for your utility knife to ensure it does not puncture the other pouches. This is a relatively more affordable belt when compared to others in the market, and so you will be getting quality at a bargain. The impressive 6-layer construction of this tool belt is one of the elements that set it apart from other as it makes it rugged and highly durable. Besides the tough construction, this belt set has been designed to be widely compatible with things like suspenders, pouches, holsters, and bags to allow you to create a more custom belt that suits your needs. Also, the belt has a heavy-duty buckle and also comes with a holder holster and hammer loop to allow it to accommodate various hand tools. And there are up to 27 customized pockets and loops to ensure that you can carry everything you need for a project whether you are a plumber, electrician or carpenter. There are also a couple of clips to hold your tape measures. You can also be certain that this will be a super comfortable tool belt to wear thanks to the heavy and comfortable padding. When compared to similar quality tool belts, this one is also more affordable. Another top-notch quality electrician tool belt and bag, and it will be a perfect gift for any electrician that you know. It is a heavy-duty DuraTek nylon product designed to be lightweight but rugged and durable enough to ensure you get value for your bucks. Also, it has the bar-tack stitching and some metal rivets that help to ensure you get an even longer service life. TradeGear makes this tool belt with user comfort in mind and they use a high-density and highly-breathable memory foam padding that also includes a contoured back support and air channel ventilation for maximum comfort. 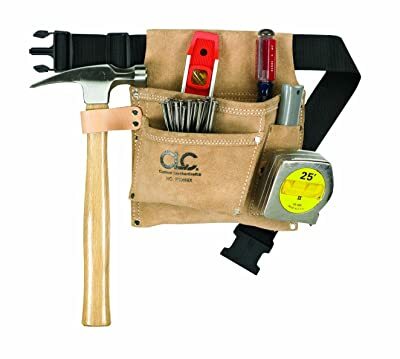 There is also more than enough storage space on this tool belt for an electrician as it will include 2 tough pouches and 27 pockets that come in varying sizes to hold various kinds of tools. And with the included carry handles, you can also move it easily from one point to the other even when it is full of tools. These handles are also one of the reasons why the tool bet is easy to wear and remove. Custom Leathercraft is famous for making some of the best work belts in the market and this particular one is designed to provide a more affordable but still high-quality option. It is made with heavy-duty and thick enough leather that will not tear or puncture easily to make this a rugged tool belt that can handle almost any work environment. 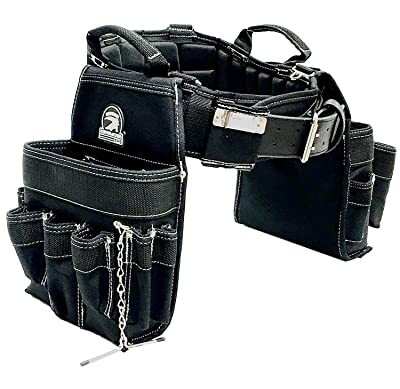 This top quality tool belt features a total of 12 pockets with 4 of them being for nails and your main tools and 8 smaller ones for other essentials. Also, the front pocket has a double gusset design that ensures easy access. And the tool belt will include a hammer loop and a rugged buckle designed to resists buckling even under pressure. 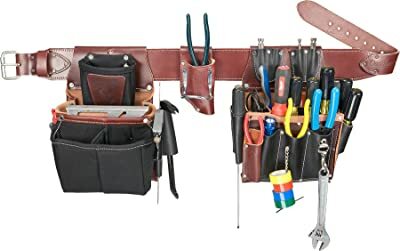 With this affordable tool belt, you will also get some unique pouch handles that will also be quite handy, and some tight pencil holders that will not drop anything. Many people use a tool belt because they are required to have one by their boss or foreman or even because they believe it is necessary for the job. But, why do you actually need a tool belt? Here are some benefits of wearing a tool belt that should explain this in more detail. Time-Saving: Because you will not need to keep walking back and forth to your vehicle or toolbox to pick tools and other things like nails and screws, you get to finish jobs faster with a tool belt. Also, you will save a lot of time in finding the tools as the belt makes them easy to organize. Improved Work Efficiency: With a tool belt wrapped around your waist, you will be able to work more efficiently, and this is regardless of whether you are working alone or with some support. The high efficiency comes from the fact that you will have all the tools you need nearby. No Back Pain: One of the most common problems that many handymen struggle with is back pain, but with a tool belt, this will almost never be an issue as it eliminates the need to keep bending to pick up tools. Prevents Tools: By keeping your tools organized, a tool belt will also minimize the risk of losing them in the job site. When it comes to picking the best work belt, you will have myriads of options to choose from, and while this is a good thing, it will also make the decision harder for you. But, finding the perfect one for your craft or profession should not be hard if you watch out for the following things when shopping. When it comes to buying a tool belt, one of the most important things that you will need to do is match it to your trade. And this is because different professions will use different kinds of tools, and so the belt that you choose should be able to accommodate your particular tools. As you are choosing a tool belt to suit your profession, it is also important to decide whether you will also want to use it for a specific job or for various tasks. Also, you need to know whether you will be using heavy consumables or not because this also affects your choice. Below is a brief breakdown of the tool belt that you will need depending on your profession. A tool belt is a must-have for every carpenter regardless of your skill level. Because carpenter will have lots of tools, tool belts dedicated to carpentry tend to have lots of pouches. Also, the pouches are often covered to offer protection from the sharp tools and also keep the blades sharp. And they are also dust-proof because there is always a lot of wood dust flying around. Tool belts dedicated for electricians will include several pouches and pockets including some special ones that you cannot get in other tool belts. They will also include enough space for hydraulic machines and other instruments that they need when they have to climb a pole. And they are in most cases made from polyester and nylon. Craftsmen will need lots of different tools, but this depends on the particular job they are doing. And so tool belts meant for them will have some highly versatile pockets and punches designed to accommodate different kinds of tools. For roofers, a good tool belt should be able to accommodate all his tools as he will need to hang from the wall or roof for extended periods. Also, their tool belts need to be lightweight and super comfortable due to the nature of their job. Some zippered pockets for carrying nails, screws, and nuts are also crucial. 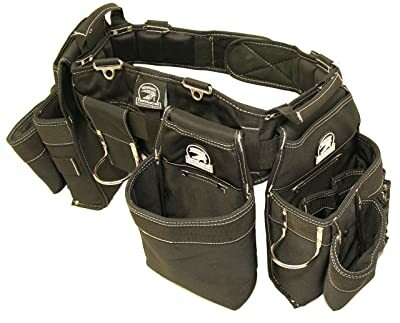 If you are an HVAC technician you will need a tool belt that has pockets for the large tools that you need when repairing air conditioners and other machines. There should also be some zippered pockets for accommodating all the small screws, nuts and bolts to avoid losing them. One of the most important characteristics of a plumber’s tool belt is waterproofness because of the environment that the plumber has to work from. A waterproof belt helps to keep water out of the tools and components. But besides being waterproof, the tool belt should also have lots of pockets and pouches. The number and size of pockets on the tool belt matters a lot, and it is one of the most important things to consider when choosing the right one for you. Most will come with everything from small pockets to larger ones for power tools. Also, some will be zippered and others will be open. And so before you settle on any belt, you should make sure that the pockets are appropriate for you. Because the material will determine the durability of the tool belt and hence its usefulness to you, it is also a vital factor to consider. Here you will need to choose from options like full grain leather and canvas which are tough and highly durable and other materials like nylon and polyester which are lightweight and more flexible. Each of these materials also has some cons, for example, leather can be quite pricey, and so weighing between the pros and cons will make the choice easier for you. When it comes to the design, there are two primary options to choose from which are the waist and harness tool belts. The right design for you will depend on your work and preferences. But, the waist tool belts are more universal while the harness ones are often the best choice when you will be working in elevated places. Like with any other belt type, your tool belt has to fit perfectly to work well for you. Hence, it is always vital to consider the waist size when shopping. Look at the maximum and minimum waist size which is typically in inches and determine whether the belt will fit you or not. Handles are very useful for carrying the tool belt, and they also make it easy to wear and remove the belt. Before settling on any tool belt model, you should check the number and size of handles that it is equipped with. Because the tools that you will be carrying will be quite heavy, you do not want to end up with a tool belt that adds a lot of extra weight. The best tool belt for you is one that is both lightweight and well-built. Be sure to check the weight of the belt when empty to decide if it will be light enough for you. Even if the waist size is perfect for you or the fit is excellent, it does not mean that the tool belt will be comfortable for you. Other things like the material and how breathable it is and also the softness and padding that it offers will also determine the level of comfort. A warranty is your best assurance that the tool belt you buy will serve you well and last long enough to ensure you get great value for money. Before you settle for any tool belt model, you should check the warranty length and terms to make sure they protect your investment. The longer the warranty the better but also make sure that the manufacturer has a reputation of honoring warranty terms. Should I Wear A Tool Belt With Suspenders? Although it is not always necessary to wear a tool belt with suspenders, it is always a great idea. When a tool belt is full of tools it can be quite heavy which means it will keep bringing your pants down and this can be quite embarrassing. 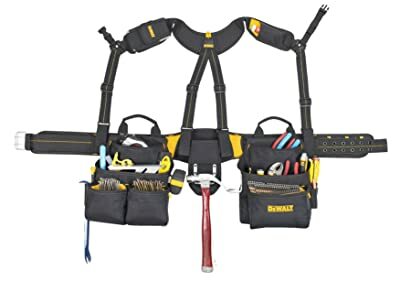 By wearing suspenders with your tool belt you will be able to redistribute the weight to prevent back and hip pain that results from carrying heavy tools on your waist. A tool belt is one of your most valuable possessions whether you are a plumber, roofer, electrician, carpenter or even a craftsman as it makes it easy and more comfortable to carry your tools when working. With a good tool-belt, you also get to save a lot of time, better work efficiency and also prevent back pains and tool loss. Choosing one should now be super easy with this comprehensive guide to help you out. Lastly, even with the best tool belt, you still need to properly organize the tools in the belt for a more even weight distribution, and also care for and store it properly to ensure it serves you well for a long time.